Access control is an important option for increasing security in the home or workplace. FC Locksmith is a leader in the access control industry. We specialize in servicing a wide range of access control readers and cards in Toronto, Ontario. Our service is dependable, affordable and extremely effective. Everyone on our staff is fully committed to providing you with the service needed to enhance your security situation. We utilize the latest in modern technology to provide you with the access control you need and desire. Systems designed to boost access control are quite often used in the business world, but are growing in popularity in the residential community as well. The old lock and key is still a competent device for keeping doors locked and secure, but keys can be lost or fall into the wrong hands. When you invest in a device used to control access you are providing yourself with the ability to monitor who enters and departs your domain. Perhaps the most common of these devices is found at entrances that require limited access. A good example of this would be in a medical facility. A car reader is located at specific entrance points. Pre-programmed cards can be provided to employees that require access to those areas. The card is simply swiped through the reader and the door will unlock and the person is granted entry. 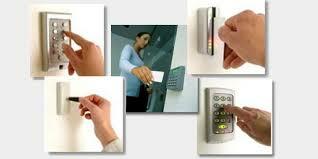 You can choose from a variety of access control readers and cards in Toronto. Different types provide you with more or less information. The reader can record which employee enters that specific area and when they left. This is a very important tool in access control. At FC Locksmith our qualified technicians do a wonderful job of installing and repairing access control card readers. We walk you through the process step by step and our friendly staff is always available to provide you with valuable technical support. Call us now and take control of how your business or home is accessed.